All dynamo powered taillights are steady-on taillights. They have no flashing mode, unlike many battery taillights, since flashing taillights are illegal in Germany, where these lights are made. There is some evidence that bright flashing lights mesmerize drunk or sleepy drivers, and I'm thinking that's not so good. And for group riding, such as brevets, flashing lights can be quite annoying for riders behind you. 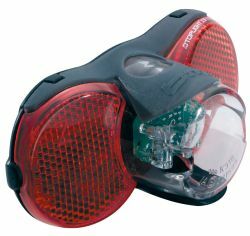 Most Busch & Müller taillights, whether battery powered or dynamo powered have built in reflectors, for added safety in the event of wire or battery failure. I do recommend that you use both a dynamo powered taillight and a battery powered taillight, if at all possible. If a wire should fail to the dyno powered taillight, the battery taillight is a backup. If your batteries fail in cold weather, the dynohub should still be working, and powering the wired taillight. But if you can only have one type of taillight, it should be a dynamo powered taillight if possible. I've read the complaints about wired taillights. What if the wire breaks? What if I need to take my bike apart to transport it? These arguments seem silly to me. If you don't take reasonable care of your bike, things are going to break, or go out of adjustment. Just as with your brake cables, you need to be sure that your light wiring is in good condition. And if you need to frequently remove the rear fender or rack that your taillight mounts to, it's very easy to install quick connectors for the taillight wire. We sell very nice gold plated quick connects from Supernova, and for Schmidt's co-axial wire, we have their Co-Axial connectors. For those folks who are concerned about the durability of the taillight wire, I now have extra heavy duty co-axial wiring available, the same wiring Wilfried Schmidt uses for their headlights. I have it in bulk, for those who want to make their own taillight wiring, and I have it in 1.9 meter lengths, complete with connectors attached for the headlight, and the taillight. Also, we can make up a taillight wire of any length, with the connectors your lights need. Just let us know. If you use a halogen headlight, and the bulb burns out, do not continue riding with the headlight switched "ON", since the full power of the dynamo will damage the taillight. Supernova lights are not fully compatible with other brands of lights. You can't mix and match Supernova headlights with other brands of taillight, and while you can use Supernova TL2 taillights with other brands of headlight, you won't have a standlight, since the Supernova taillights are dependant on the Supernova headlight for the standlight function. Supernova lights come with tough wiring for the taillight that is hard wired. They do not use the same metric connectors as used by Busch & Müller, Wilfried Schmidt and Spanninga. Also, Supernova taillights do not have a reflector. "Plus" is Busch & Müller's designation for a light with a standlight; "Standlicht" in German. The "Standlight" provides light for several minutes when you stop. The power for the light comes from a capacitor inside the taillight which is charged while the bike is moving. The Toplight Line Plus, Toplight Line Brake Plus, DToplight XS Plus, Toplight Mini, Seculite Plus and 4DLite Plus all have the same "Standlight" feature as the many B&M headlights, except that the light is as bright when you're stopped as when you're riding. 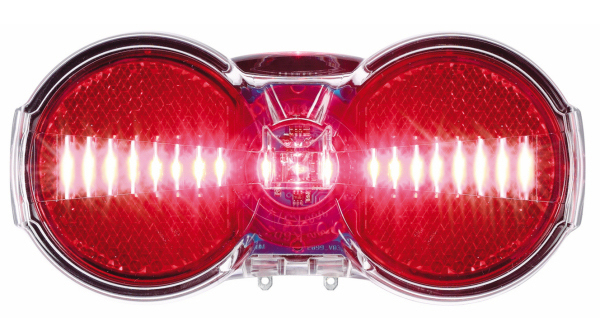 We sell one dynamo powered taillight that does not have a standlight, the DToplight XS. We sell it for those people who would like to save money, and for use on "E-Bikes". It still has a large reflector area for added safety. So if you think you need to use a battery taillight in order to have a functioning taillight when you're stopped, that's just not the case. The Busch & Müller "Plus" taillights remain lit for six or seven minutes after you stop, plenty of time for the light to turn green. Unless otherwise noted, all dynamo powered taillights on this page are 6 volt. There are two exceptions; the Busch & Müller DToplight Plus 12 and the Busch & Müller Seculite Plus 12. These are 12 volt taillights, and only work with 12 volt headlights and the long ago discontinued 12 volt Busch & Müller (B&M) Dymotec S12. The S12 is (was) a sidewall dynamo. 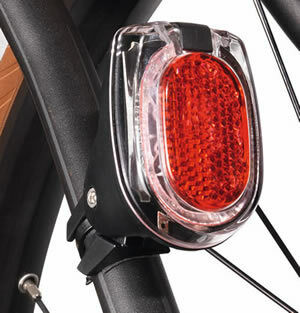 With only a few exceptions, all of the other dynamo taillights are compatible with 6 volt headlights and 6 volt dynamos, such as hub dynamos from Schmidt, Sanyo, Shimano, SRAM and modern Sturmey Archer hubs, along with sidewall dynamos such as the discontinued Busch & Müller Dymotec 6. All 6 volt B&M taillights are compatible with almost all 6 volt B&M headlights, all Schmidt headlights, and Spanninga headlights. One Busch & Müller headlight is not compatible with a few older taillights. This is the Luxos U headlight. See below for details. B&M taillights are not compatible with Supernova headlights, and Supernova taillights are fully compatible only with Supernova headlights. Please do not mix Supernova dynamo lights with other brands of lights. 6 volt components are not compatible with 12 volt components. Until the fall of 2013, there was no dynamo powered taillight designed to mount to a frame's seat stays, and no dynamo powered taillight compatible with most dynamo systems to mount to a seat post. Supernova has one for their lights, but it doesn't play well with other brands of headlights. But now, everything has changed. The new Secula Plus for Seat Post or Stay has a pivoting mount so it clamps to either the seat stays on a normal bicycle, or to the seat post. But the new mounting system is only part of the story. I've just swapped the Seculite Plus taillight that was on my Rambouillet for the new Secula Plus. The Seculite Plus had been mounted in the same spot using an old Cateye clamp and the B&M Cross bracket. The light on the right side is the B&M Relite D. This is a fabulous little taillight. And it has a standlight, keeping it lit for a few minutes while you're waiting for that traffic light to change green. Full over-voltage protection. 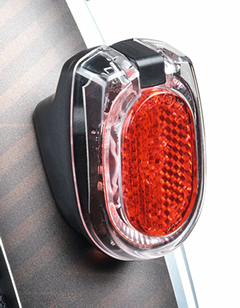 In the event of a headlight failure the Secula Plus taillight will not be damaged by the full power of the dynamo. Scroll down this page to the fender mount section for another version of the Secula Plus designed to mount on a rear fender. And, we now have battery powered versions of these taillights. The ultimate minimalist taillight is the µ from Busch & Muller. The µ symbol is pronounced meuw, as in what your cat says to you when it's hungry. And µ stands for Micro, so from here on I'll just call it the Micro taillight, lest anyone think I'm a hungry cat. The Micro has a beautiful aluminum housing, anodized silver or black, to match their IQ-X and IQ-XS headlights. Of course they work with all other Busch & Muller dynamo headlights, as well as many other brands of headlights. The Micro comes with two mounts; one for fender mounting, and another for mounting to a seat post or a frame tube such as a seat stay. As of this writing, April 18, 2019, I don't have a photo showing the seat post / seat stay mount. The Micro is expected here by the end of April. The Micro must not be connected directly to a dynamo, but instead must only be connected to the taillight outputs of a dynamo powered headlight. The Micro has no built in reflector, it's a true minimalist taillight. The length is 29mm. The diameter in the center is 19mm. The diameter of the lens is 17mm. It's the smallest taillight allowed by German law for use on German roads. The Micro can pivot on its mount. So, while the photos of the Micro taillights above show the mount positioned as it would be a little below 45 degrees on the fender, it could easily be set to mount at the very top of the rear fender. Wherever you choose to drill the two holes in the fender is just fine, provided the light can be aimed so that the light is positioned horizontally, exactly as you see in the two photos above. That way the brightest part of the beam is being projected horizontally. There's no point in aiming your taillight up into the sky, or down towards the road. And never ever mount any taillight between the rear end of the fender and the rear-most fender strut, since that can lead to cracking of the fender itself at the rear strut mount. The rack mount taillights all mount to a horizontal bracket with two holes either 50mm or 80mm apart. 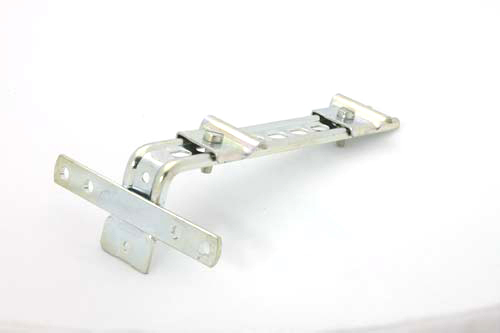 I sell some brackets to allow mounting taillights onto racks without suitable mounts. The Tubus Cargo and Logo racks incorporate the proper mount for these lights. 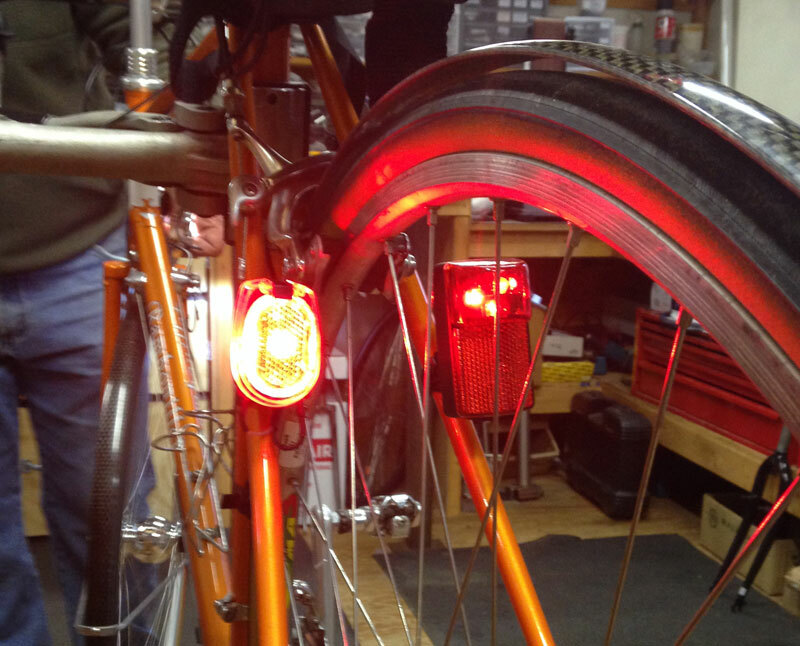 This is the ideal taillight for the urban cyclist. The light from two very bright red LEDs is spread across the width of the light, and functions just like the brake lights on an automobile. The Toplight Line Plus uses an interesting fresnel to spread the light from two LEDs into a line across the width of the light, providing increased surface area for the light, and making it more visible at a distance. The Toplight Line Brake Plus senses when the bike slows under braking and glows brighter. It does this by monitoring the AC frequency from the hub. During braking, the AC frequency slows quickly, and then makes the LEDs pulse or flicker, hopefully getting the attention of that fool in the jacked up SUV behind you. The Toplight Line Brake Plus has the usual standlight, and mounts to the rear of many racks. But unlike the other rack mount taillights, the Toplight Line Brake Plus only has mounting bolts 50mm apart, unlike the others which give you the option of either 50mm or 80mm. This taillight is narrower (92mm) than any other rack mount B&M taillight, making it more suitable for some of the new narrow racks. Even though the light's housing is narrow, the light you see at night is much larger than with other taillights. There's a red tab on the bottom which you can press to switch off the standlight when you park the bike. It does this by discharging the capacitor. This taillight can be wired using 2.8mm spade connectors which I stock or bare wire leads. A slider switch grips the bare wire leads. Either way you get a very secure connection. But you must use two conductor wire, power and ground. 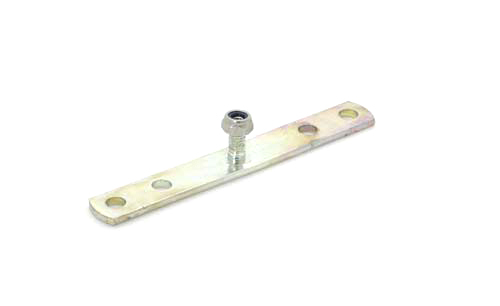 The mounting bolts do not conduct ground, so there is no chance of creating a short by using the wrong connectors. 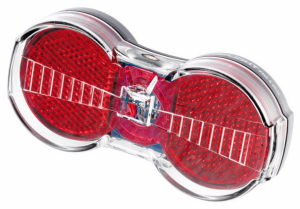 At only 92mm wide, this taillight fits the newer, narrow pannier racks that are becoming more popular. An earlier version of this taillight did not have the pulsing function during braking, though it did get brighter during braking. That earlier version is not compatible with the Luxos U headlight. They are now sold out. When used with the Luxos U headlight, it is critical that polarity be maintained between the headlight and the taillight, otherwise the Toplight Line taillights will not function properly. So, + on the Luxos U headlight must be connected to + on the taillight, and - on the Luxos U headlight must be connected to - on the taillight. This is critical! Full over-voltage protection. In the event of a headlight failure the Toplight Line Brake Plus taillight will not be damaged by the full power of the dynamo. The less expensive Toplight Line Plus has all of the features of the Brake Plus seen above, except for the brakelight function. Otherwise it looks and works the same. Also, it works with any 6 volt Busch & Müller headlight, including the Luxos U. When used with the Luxos U headlight, it is critical that polarity be maintained between the headlight and the taillight, otherwise the Toplight Line and Toplight Line Brake Tec taillights will not function properly. Full over-voltage protection. In the event of a headlight failure the Toplight Line Plus taillight will not be damaged by the full power of the dynamo. For battery powered versions of this taillight, go to this page. Not quite as bright as the very bright Toplight Line, seen above, the Toplight View is still quite bright and will get the attention of drivers. The light from two LEDs is spread across the top and bottom of the taillight with a reflector in the middle. 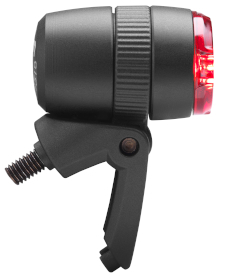 We now also have the Toplight View Brake Tec with pulsing brake light function. No taillight wire is included. You may use a wire with either bare ends, or with 2.8mm female spade connectors. Ask us for a suitable wire for your application when you order. Full over-voltage protection. In the event of a headlight failure the Toplight View Plus taillights will not be damaged by the full power of the dynamo. 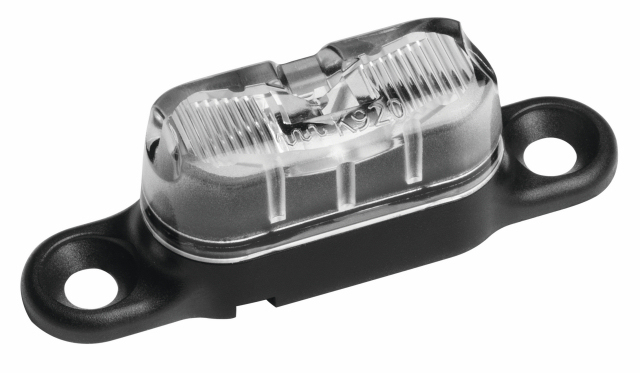 When used with the Luxos U headlight, it is critical that polarity be maintained between the headlight and the taillight, otherwise the Toplight View and Toplight View Brake Tec taillights will not function properly. B&M's smallest rack mounted taillight. 92mm wide. The Mini has a single bright LED in the little housing at the top, and the rest is reflector. The LED glows red, of course. The taillight wire ends must have the little 2.8mm female connectors, which we sell. The mounting bolts aren't electrically grounded, so you must use a 2 conductor wire, but it means it's impossible to create a short. Let us know how long you need the taillight wire to be. We'll make sure you have the right connectors. You cannot wire this taillight without the proper connectors. There's no way to attach bare wires to this taillight. No button to shut off the standlight. That helps keep the price low. Also, it works with any 6 volt Busch & Müller headlight, including the Luxos U. Full over-voltage protection. In the event of a headlight failure the Toplight Mini Plus taillight will not be damaged by the full power of the dynamo. This is a big picture of a very small taillight. The mounting holes are 50mm apart, just like most other Busch & Müller taillights. The single LED glows bright red, so don't be fooled by the clear lens. And the optics in the lens spreads the red light across the width of the lens, so the driver behind you sees a lot more than just a point source of light. This has a standlight, so it will stay lit for several minutes after you stop. Unlike a few other B&M taillights, the Toplight Line Small cannot handle the full output of a dynamo without a headlight in the circuit. So, never wire this taillight directly to a hub dynamo, as it can be damaged if the headlight is switched off. 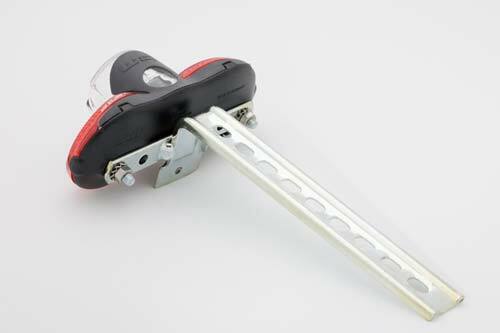 The Busch&Müller DToplight XS Plus for 6 volt dynamos mounts on a rack with either 50mm wide studs or 80mm wide studs. Wiring not included. This replaces the DToplight Plus which I no longer import. 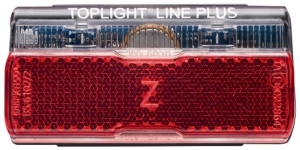 As of November 2009, the XS Plus has been upstaged by the new Toplight Line Plus taillight. See above. I will continue to stock the DToplight XS Plus, for those people who prefer its distinctive look. But in my opinion, the Toplight Line Plus, at about the same price, is a better choice. 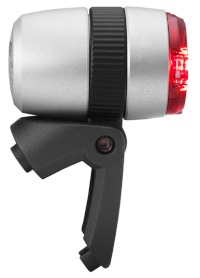 If you would rather save some money and do without the standlight feature, we also have the DToplight XS (6 volt dynamo). It looks the same as the DToplight XS Plus but without the Plus it has no standlight. The light will go out completely when you stop. Of course you still have the reflector. This is also a good choice if you have an "E-Bike". DToplight XS and XS Plus taillights can ground via the fixing bolt on the left side. So, when running two wires, be sure not to create a short. Wire power to power and ground to ground between the headlight and taillight. Not compatible with the Luxos U headlight. If you use a halogen headlight, and the bulb burns out, do not continue riding with the headlight switched "ON", since the full power of the dynamo will damage the DToplight XS Plus taillight. 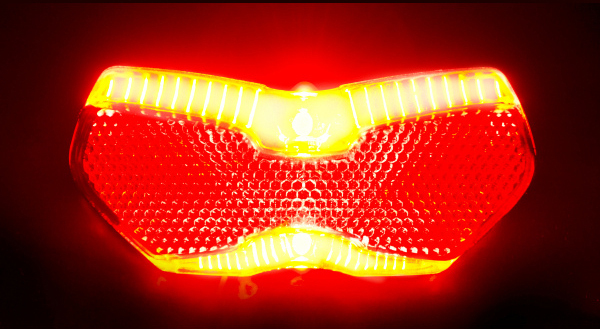 Our newest taillight is the Toplight Flat S Plus (6 volt dynamo). It's less expensive than any other dynamo taillight with a standlight. Compared with the DToplight Plus, the Toplight Flat S Plus uses a single LED instead of two. It has the same "LineTec" technology which uses a series of mirrors to spread the light from the LED across the width of the taillight, so you eyes see a line of light rather than a point source. This taillight, with a Dymotec sidewall dynamo, and a Lumotec headlight makes for a nice system for not a lot of money. 50mm bolt spacing. While the LED itself is small, it's still very bright and the optics makes for exceptional visibility. Wiring not included. Works with any 6 volt Busch & Müller headlight, including the Luxos U. And here's what happens with the light ON. Keep in mind, this isn't quite how it appears at night. The LED is red, so while is appears in the photo that the LED is white, that's simply because of the way the image was exposed. To show the red reflector correctly, by setting the camera to expose for the reflector, the light from the LED is overexposed in the photo. Those bright vertical bars you see will be red at night. Many of the taillights we sell have connections for bare wire ends. The double strand wire we sell from Busch & Müller has connectors on one end only, for attaching to the bottom of the headlight. And you then use the bare wire ends for the taillight attachment. But the Toplight Flat S Plus has only male connectors, meaning you'll need a wire that has female connectors at both ends. This doesn't exist all made up from Busch & Müller, so you'll need to make your own. We'll supply the standard double strand wire with connectors attached at one end, and some extra connectors. When you know how long the wire needs to be, just cut off what you don't need, and attach the loose connectors to the bare end. Or if you can measure beforehand, tell us the length and we'll do it for you here. Now you can attach the Toplight Flat S Plus to your headlight. Also, some taillights use the mounting screws to supply the ground connection. That's not the case with the Toplight Flat S Plus. It will not ground to a rack automatically. You need to use two wires, one for power, and one for ground, hence the need for a double strand wire. We also have heavy duty wiring from Wilfried Schmidt. Full over-voltage protection. In the event of a headlight failure the Toplight Flat S Plus taillight will not be damaged by the full power of the dynamo. The Busch&Müller DToplight series have a single very bright LED inside the center lens. These are 12 volt taillights only for use with the Dymotec S12 bottle generator and Lumotec Oval Plus 12 halogen headlight. No exceptions, and no work-arounds! 118mm wide. If you use a halogen headlight, and the bulb burns out, do not continue riding with the headlight switched "ON", since the full power of the dynamo will damage the DToplight Plus 12 taillight. Fender mount taillights require two holes drilled in the rear fender. The holes should be 5mm in diameter, one above the other, 20mm apart, center to center. Care should be taken to mount the light so that the brightest part of the beam is horizontal, putting it at driver's eye level. Where you mount the light along the curve of the fender determines where the beam is aimed. I only recommend mounting my fender-mount taillights on high quality fenders such as Gilles Berthoud, or Esge/SKS. Some other fenders, particularly those made of only plastic, are too light and will easily break when you mount a light on them. 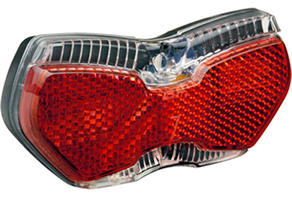 New for 2013, the Secula Plus taillight is very bright, projects over a wide area, and presents a relatively large surface of light for an approaching driver to see. It doesn't ground to the frame via a metal fender, so it is fully compatible with the Luxos U headlight. Of course it has a standlight. Mount it so that the reflector surface is vertical for the best performance. You'll want a full coverage fender to mount this properly. "Shorty" type fenders won't allow the light to be mounted vertically, so much of the light's output will end up in the sky. At least the bats will see you. They're always watching, looking for a meal. 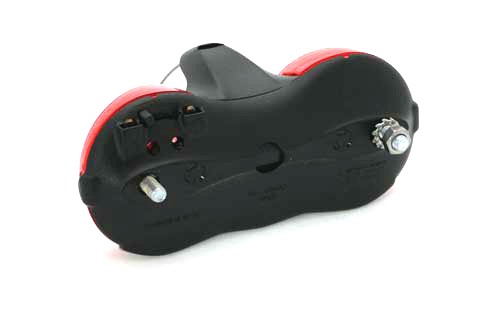 For the seat stay or seatpost mount version of the Secula Plus, scroll up this page. Since this taillight can ground to the frame via it's mounting bolt, I don't recommend it for use with the Luxos U headlight. The LED light is in the top clear section. The LED glows red. The reflector is below. As with all "Plus" designated lights, it has a Standlight. 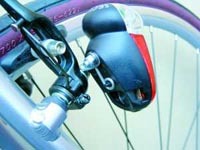 The Seculite Plus was designed to be mounted on a rear fender. But with the Cross Bracket, it can be mounted on a rear cantilever brake stud. If you use a halogen headlight, and the bulb burns out, do not continue riding with the headlight switched "ON", since the full power of the dynamo will damage the Seculite Plus taillight. All taillights are LED types. They do not have bulbs to burn out. I have never sold taillights with bulbs and never will. This is a forward facing view of the DToplight XS Plus upside down. It's upside down so you can more clearly see the wiring connections on the left side. You feed the bare wire ends up into the connectors and then slide the little locking tab over to secure the wires in place. You see here two bolts coming out of the housing. When you receive the light there will be no bolts extending out. But there are four positions where you can push out the plastic and place the bolts from the inside. You can choose either 80mm spacing or 50mm spacing for the bolts. Here the spacing is 80mm. Some racks like most Tubus models have a bracket on the rear to mount these lights. But some don't. So we have adapters. If your rear rack has a single hole in the rear that will take a bolt which faces in the direction of travel, you can mount this bracket into that hole and then you'll have the 50mm and 80mm mounting points for any of the Busch & Müller rack mount taillights such as the DToplight XS Plus above. 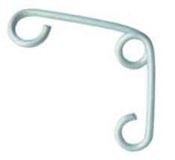 We sell this with a nylock nut included, as in the photo. 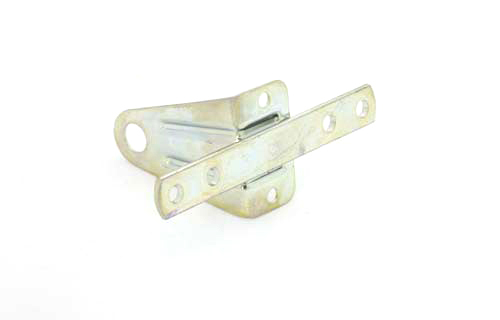 If your rack has no hole in the rear but does have either a top plate or some cross braces, this T bracket can be clamped to the top of your rack and then the taillight can be bolted to it. Here's a DToplight XS Plus mounted on a T bracket using the 80mm bolt positions. 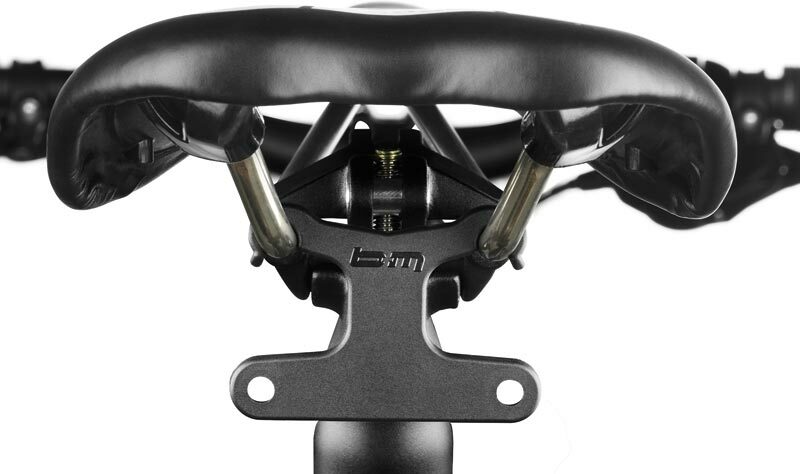 New as of 2016, the saddle rail mount clips onto the saddle rails just behind the seat post clamp and provides the 50mm bolt spacing for rack mount taillights. Obviously, this won't work if you have a saddle bag back there. I sell several Tubus racks which incorporate a mounting bracket which will fit many types of Busch & Müller tail lights including the DToplight Plus and 4DToplight Permanent. The Tubus Cargo is a heavy duty tubular chromoly steel rack for extended touring and heavy loads. On some bikes, you don't need to run two wires from the headlight to the taillight. Headlights and taillights can often get their ground connection through the frame. So often a single wire to the headlight and then to the taillight is all you need. But there are some situations where you won't be able to do this. For instance, if you mount the headlight on the front fork crown with a steel mount, the ground link would have to pass through the headset to get to the taillight. With most headsets that's fine. But some headsets will not pass electrical current through them. Shimano cartridge bearing headsets, for instance, won't allow you to do this because the material used in the cartridges is an electrical insulator. If you mount your headlight with either my custom handlebar mount or the R&M handlebar mount, it will not be grounded to the frame, and you will have to run a second wire. But that wire doesn't necessarily have to extend all the way to the dynamo. You could run a short wire to a metal part on the bike, like a brake bolt, and pick up ground from there. And some headlights and taillights won't connect via their mounts to ground, and must be used with dual strand wire. The Lumotec Fly and Lumotec IQ Fly are two such headlights, and the Toplight Flat Plus headlight also requires two leads to function. Before placing your order, think about how you want to run the wires. If you have any doubts about whether the included wires will be sufficient, just ask. We'll figure it out together. It's best if you are near your bike when you call if you have questions about wiring. Our double strand wire from Busch & Müller is quite good, and a good value if you're watching your pennies. But if you want the most durable wiring on your bike, you should use the Schmidt CoAxial wire for your taillight connection. It's the same wire they use for their E6 headlight. Some headlights, such as the Schmidt E6 and Edelux, make their ground connection to the taillight via the base of the light itself, and the power connection via the same 2.8mm connector used at the taillight. Others, like the Busch & Müller Lumotec IQ Fly, have two 2.8mm connectors for ground and two for power, and the base of the light is molded plastic, no electrical connector at all. So the Schmidt CoAxial taillight wires are available for both types of headlights. Please specify what headlight you'll be using when you order a CoAxial taillight wire, so that we send you the correct type. Both types are available either with bare wire for the taillight end, with loose connectors, or with the 2.8mm taillight connectors already attached and protected with shrink tubing. Schmidt CoAxial wire by the foot, no connectors. $ 1.00 per foot. You can use this to extend a headlight to hub wire, or any application needing a durable coaxial wire. If you want to wire a taillight on a tandem, this is your best option. And we have all of the connectors you might need separately. To extend an existing wire, or to create an easy and inexpensive "break point" in a wire, use the male connector. Almost everything you need to know about pricing and ordering a lighting system can be found here. Remember to order wiring if you need it. If you prefer, see this page for a list of local bicycle shops that generally stock our products, or can order them for you.